Donations help to provide food and enrichment for these bats. The fruit bats you will see have been rescued from the exotic pet trade, research, and retired from zoos. Many of these bats have had terrible lives before finding sanctuary with us. Some of the bats came from people who purchased them as pets and then realized they were ill-equipped to care for them (we commend these people for doing the right thing). The bats range in sizes from a body of 2 inches long with a wingspan of 6″ to a body about the size of a small squirrel. Night time footage will be in night vision, which makes the bats’ eyes and other objects glow. During the day the cameras are under normal lighting so “maid service” can occur. Volume is turned on at night so you can hear the fruit bats vocalizing as well as the toys (babble balls) making funny noises. The fruit bats usually become active about 6 to 7pm CST. This view shows the fruit bats’ toy box as well as toys that the bats like to hang from and play with. A sweet potato kabob, a mango net and salad buckets are in view. Treat time (mango, lettuce & cubed melon) occurs between 7:00 to 9:00 every evening. Note: Treat time varies depending on the number of rescues we’ve received and cared for that day. This view shows the “feeding tree” where juice bottles, romaine lettuce, treat cups and puzzles and troughs of fresh cubed fruit are hung. The fruit mixture contains apples, pears, melon, berries & banana and assorted tropical fruit. A group of elderly Egyptian fruit bats like to gather under the tree every evening. African fruit bats, Jamaican fruit bats and short-tailed fruit bats may also be seen foraging. This is one of two roosting areas used by the fruit bats during the day. There are hammocks and plush vines to cling from as well as roosting curtains to hide behind. A sweet potato kabob and juice bottle is also available. Several elderly Egyptian fruit bat ladies like to crowd into the fabric hammock to sleep and tiny short-tailed fruit bats can often be seen hanging in front of the camera. This camera is always in night vision. The semi-outdoor flight area is enclosed in a bay with two 14′ doors that open to the backyard and the woods beyond that. Security bars and zoomesh guard the bay area from predators and insects while allowing the bats to enjoy the night in complete safety. Several skylights also allow natural light inside. An industrial heater is used to heat the bay area during the winter so the bats can enjoy this space year-round. 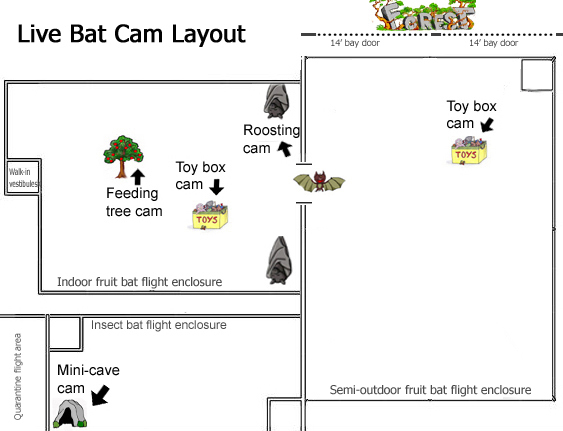 The camera faces the back of the flight area and the door where the bats are allowed to fly in and out from their indoor flight area and also shows a toy box and a mango net. The floor is lined with disposable plastic which makes cleaning the enclosure much easier. The insectivorous bats you will see are all adult micro bats (free-tails, big browns and myotis bats) ranging from 1″ to 2″ in length. These bats are not releasable due to wing injuries or other handicaps. The bats will wake and come out to eat, cluster together and vigorously groom about 8 to 9pm CST. Click here to see a in-color photo description of this camera. The camera is facing the back corner of a miniature cave where the insect-eating bats live. Simulated rock ledges provide enrichment and also hold food (mealworms). Occasionally a worm will escape and can be seen crawling along the wall or ceiling. This camera is always in night vision. Bat World Sanctuary is an Amazon Associate. Products listed here help us earn revenue to support our rescue efforts. When purchased (and at no additional cost to you) Amazon will donate as much as 10% to our sanctuary. Click below to purchase a Nest Cam like we use through Amazon.com.